There are a variety of different ways that you can change the effects and background of your images online. We’re going to be introducing you to a method that will offer just that. PLUS a step-by-step demo on how to do it. 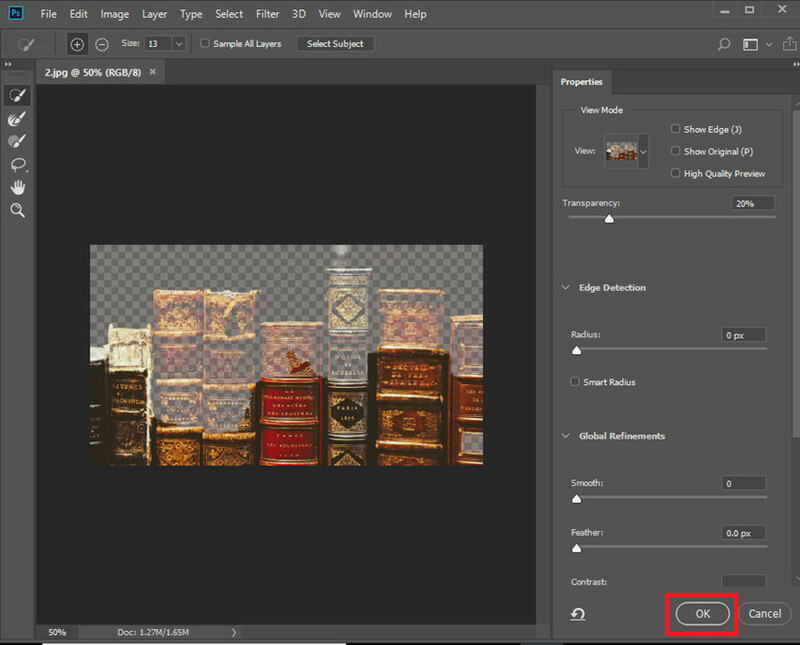 If you want to learn about other ways to change the background of your images outside of online tools, you can also use one the other methods that we introduce here. 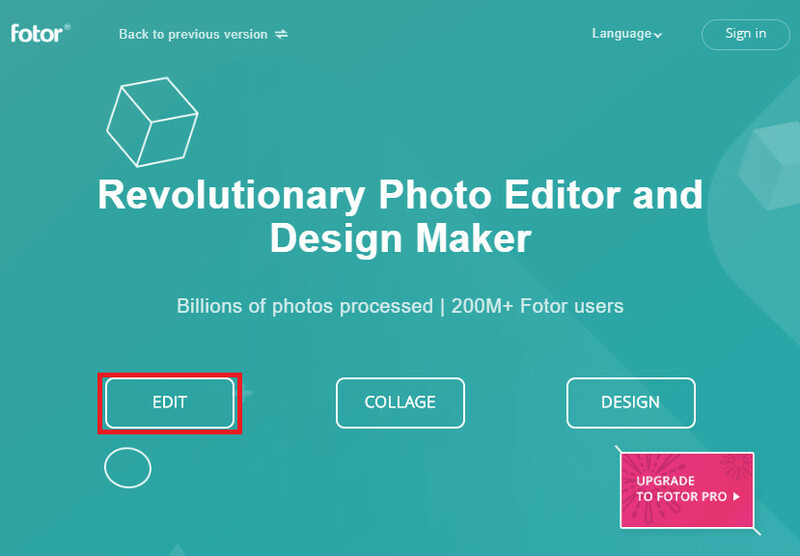 The online method that we’ll be introducing is the Fotor editor. This graphics editor will allow you to remove the background of your image and apply a couple of new effects. The only drawback is that it’s not completely free. You can try the product for free, but its background removal tools are premium and require a subscription. Click the “EDIT” box on the front-page of the website. This will open up the main photo editor — which will allow you to remove the background of the image and add effects to it too. Next, let’s import the photograph that you want to edit using the “Open” icon on the top menu bar. 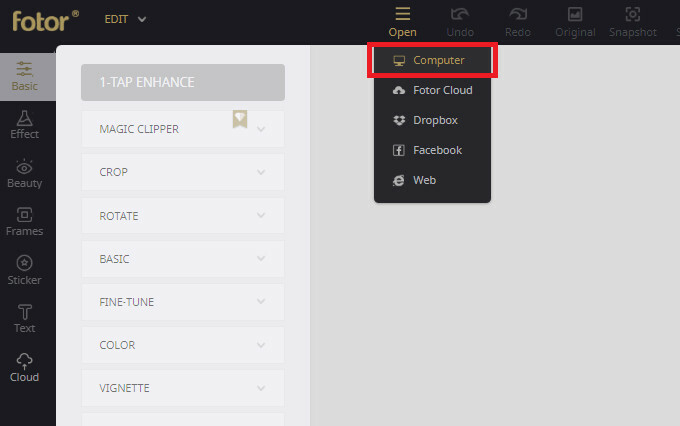 This will open a drop-down menu where you can choose the “Computer” option. 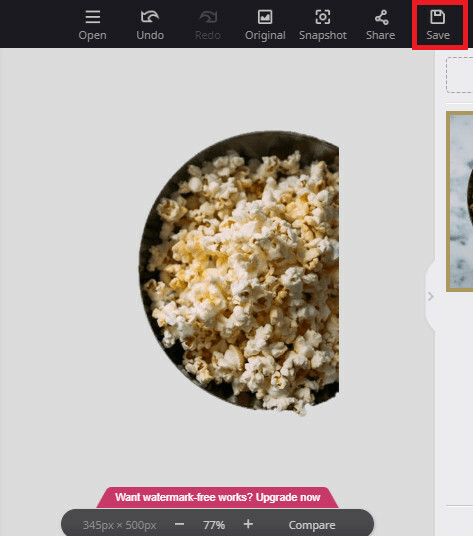 This will prompt a windows/mac pop up that will ask you to choose the image for you to edit. Removal Bush: Opposite of the retain brush, this is a red highlighter tool that will allow you to choose which parts of the image you want to delete (the background). Brush Size: Adjusting this slider will increase and/or decrease the size of your brushes. Soft Edges: This is for softening/sharpening the results of the automatic clip. 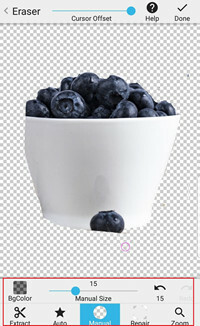 Tip: If you want to see what the image will look like without finalizing it, you can use the “Press to Preview” button. Remember to save your image when you’re done! You can do so by clicking on the “Save” icon on the top right-hand side of the screen. 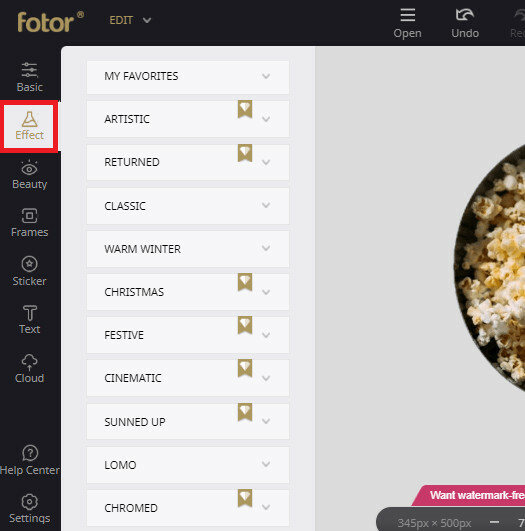 Tip: Remember, unless you want the photo to be saved with the FOTOR watermark, you’re going to have to pay for their monthly subscription. 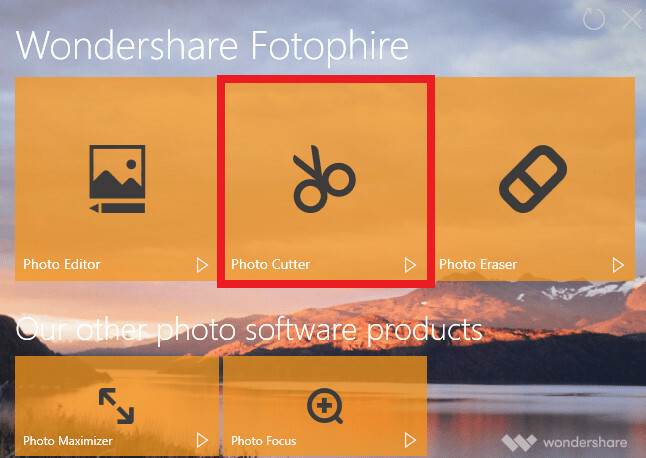 Wondershare Fotophire Editing Toolkit is an easy-to-use and powerful toolkit that can help you to get the work done easily. 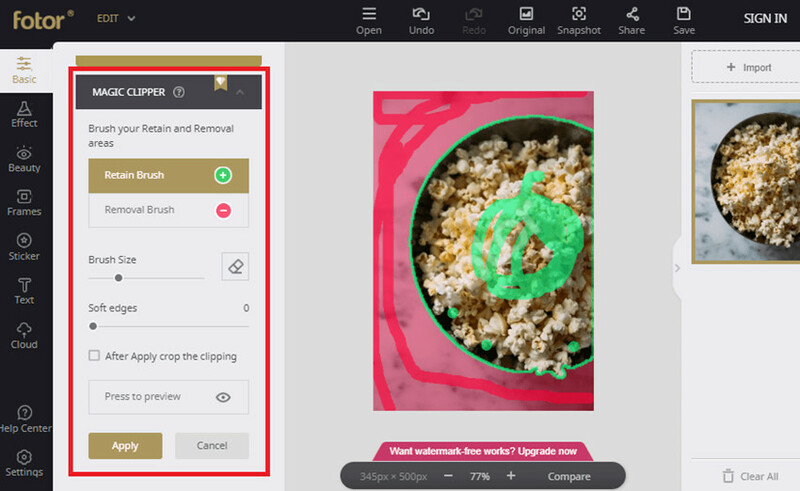 Not only is will it allow you to edit your photos in a variety of different ways, but you’ll also be able to remove images almost automatically. This can all be done using the Fotophire Editing Toolkit, which is an easy-to-use graphics editor that offers a variety of different features. Use the “Photo Editor” to add filters, effects, etc. 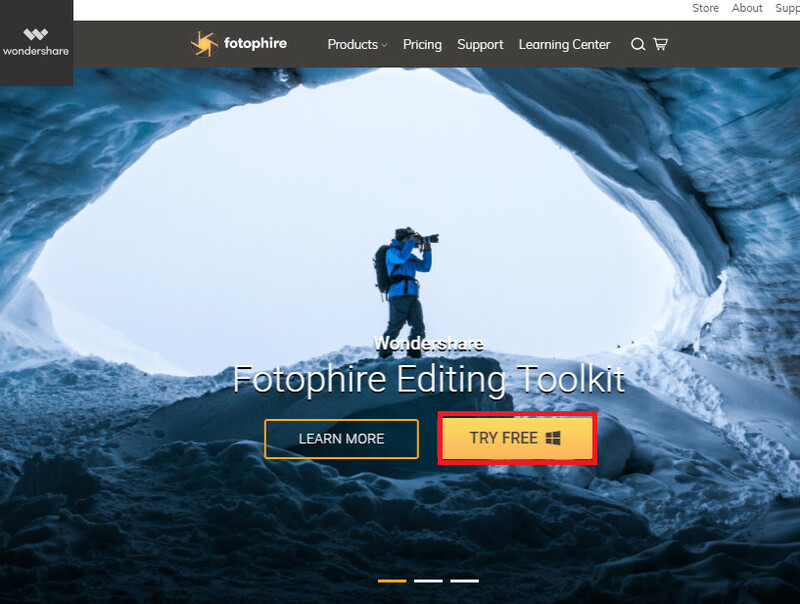 Purchase the Fotophire Editing Toolkit in order to use the FULL version, but if you’re not ready to invest just yet — you can download and install the FREE trial first. 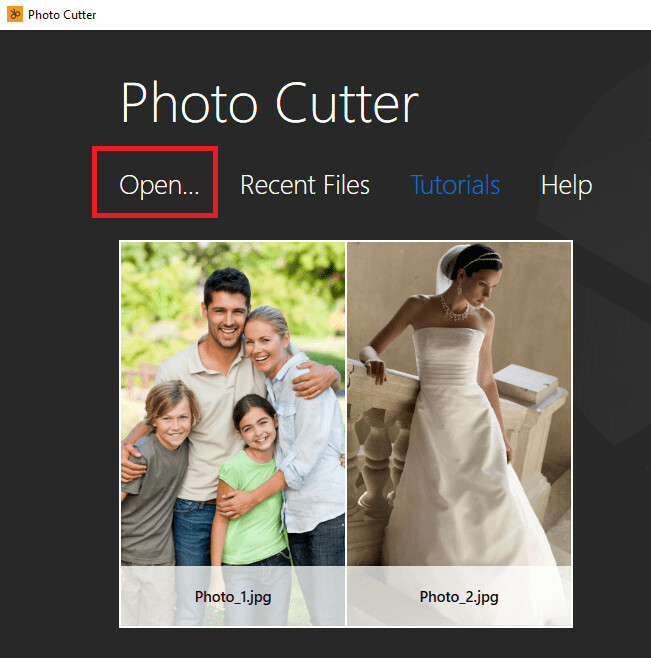 Import the image into the “Photo Cutter” editor by clicking on the “Open…” text on the main menu page. 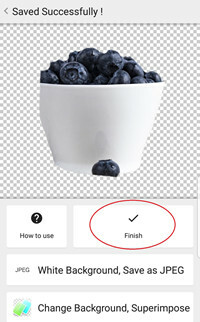 This will allow you to choose the image that you want to edit the background of. Paint Areas to Keep Tool: Use this green highlighting tool to mark the parts of the image that you want to keep. 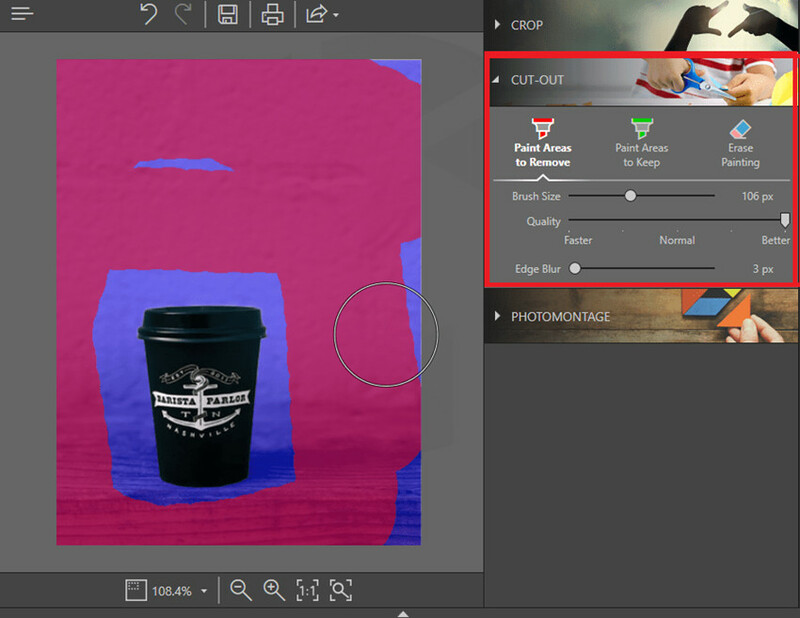 Paint Areas to Remove Tool: As for removing parts of the image that you want to delete, you can use this red highlighting tool. 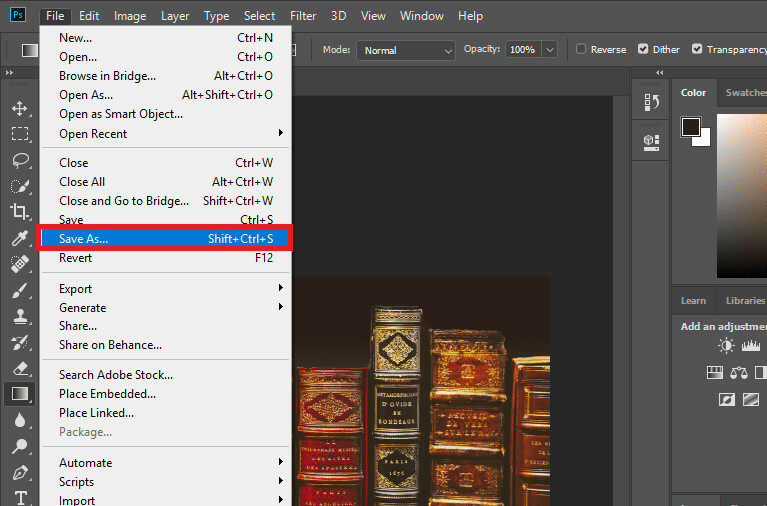 Quality: Adjusting this slider will change the overall quality of the image — making the automatic cut cleaner. Brush Size Slider: You can get into really tight spaces by decreasing the size of your brush OR enlarging it to cover larger large parts. Erase Painting: Erase some of the marks you make using this eraser tool. Edge Blur: Adjusting this slider will allow you to sharpen/blur the edges of the image. 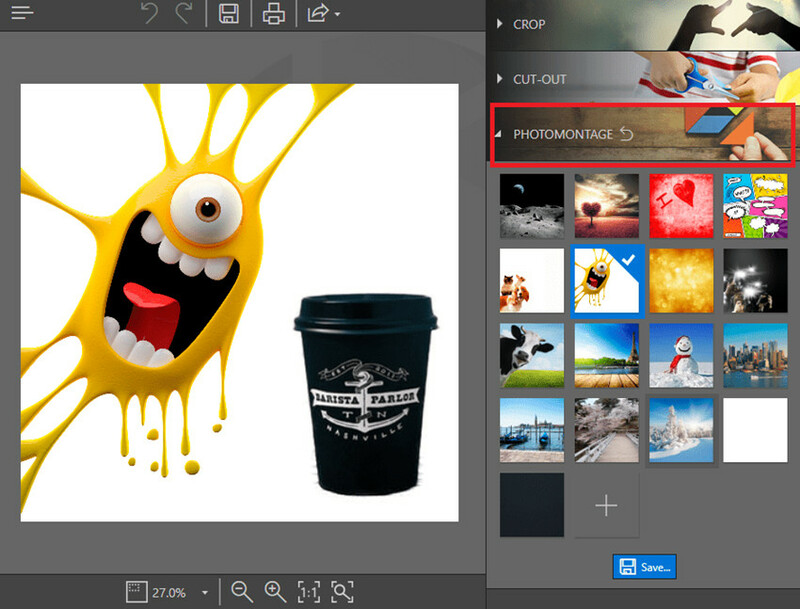 The “PHOTOMONTAGE” tool will allow you to customize the background of your image. You can choose one of the fun presets (like we did in the image below) or upload your own custom background by clicking on the “+” box. This is when we start looking at other options, and of course — we can’t talk about background photo editors without mentioning Adobe Photoshop. This is the graphics editor to have. It’s front-loaded with tons of premium tools and is used by professionals all over the world. There’s no denying that this is a powerful program, but there’s also no denying its complexity. It requires a lot of training and googling to be able to use this properly, but luckily for you — we’ve compressed the steps in the following demo! In order to start, you’re going to need to import the photo. This can be done by clicking the “Open…” button on the main menu page. 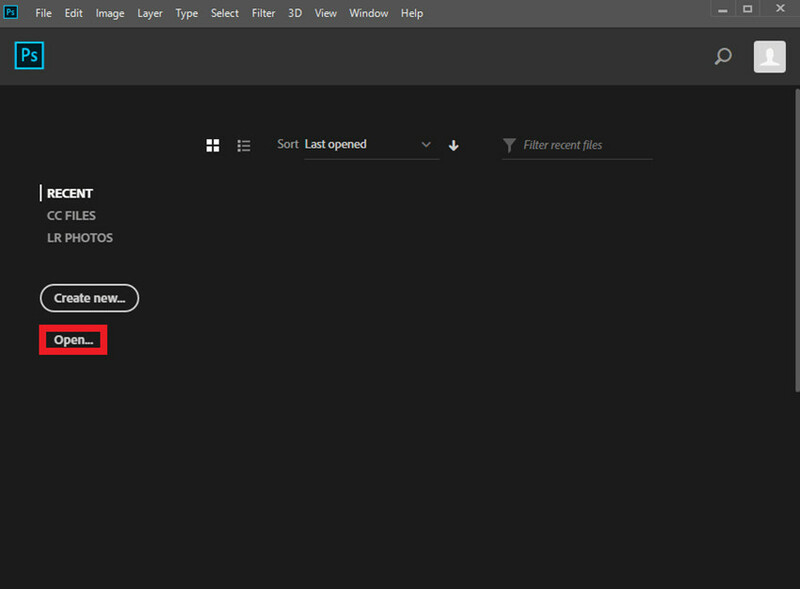 This will prompt a windows pop-up that will ask you to choose the image that you need to edit. The easiest way to remove the background of your image is to use a transparent mask. 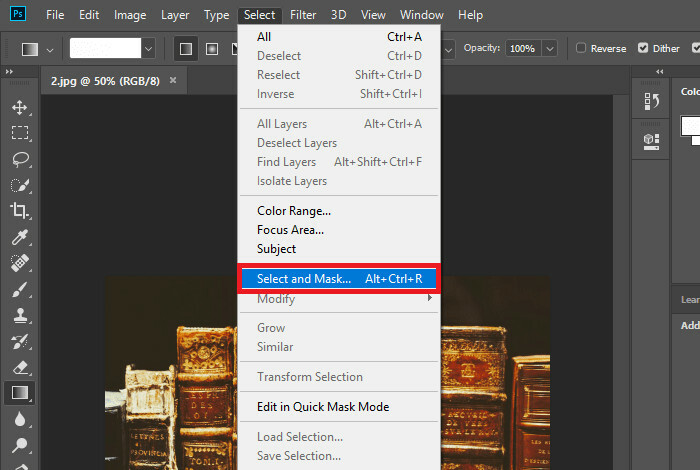 There are a couple of ways that you can apply this mask — click “Select” tab > “Select and Mask…” You can also use the keyboard shortcut Alt + Ctrl + R.
Of course, this won’t delete the background of the image automatically. You’re going to have to erase the mask around the foreground area. This will ensure that you’re deleting only the parts of the image that you need to delete (the background.) Once you’re done cleaning up the mask, click the “OK” button on the bottom right-hand side of the screen. 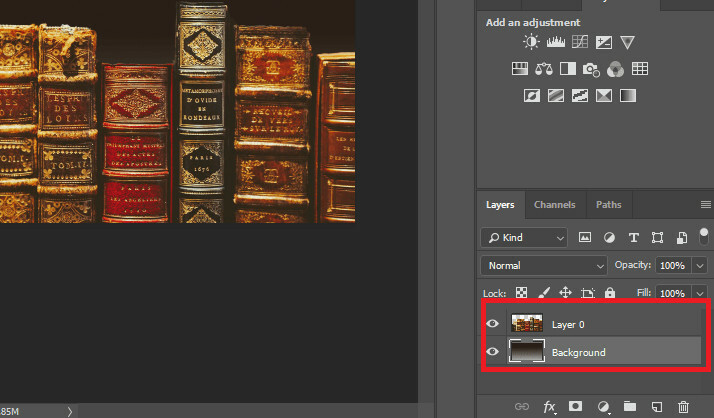 Tip: Make sure that your background layer is underneath the original layer. You’re done! Just remember to save it as an image file before you get going. To do this, click on the “File” tab > “Save as…” You will be given the option to change your image into a JPG, PNG, GIF, etc. The third method will be a Mobile App called the Background Eraser. 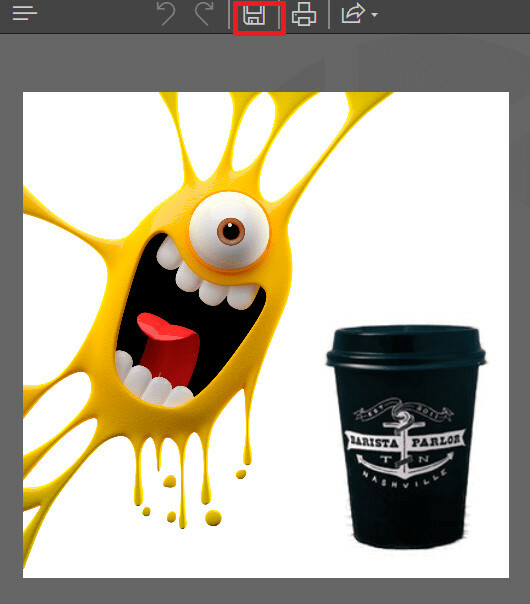 It’s a FREE app, one that contains tons of annoying pop-up ads, but it gets the job done. 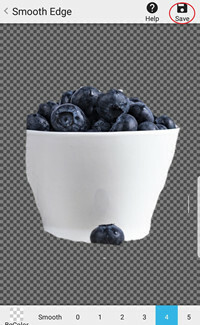 It will allow you to specifically remove the background of the image and add make sure that it looks good. The App itself is free, you can download it through this link. OR you can look it up on the App or Google play store. Either way, it should only take a couple of minutes to download and install. 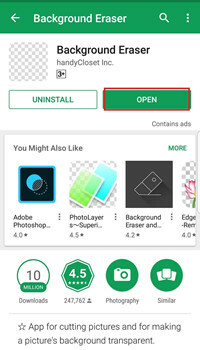 The Background Remove App will then ask you to crop out as much of the image as possible. This will make it easier for you to delete the entire background — by leaving less of it around. When you’re satisfied with the crop, you can click on the “Done” icon on the top right-hand side of the screen. 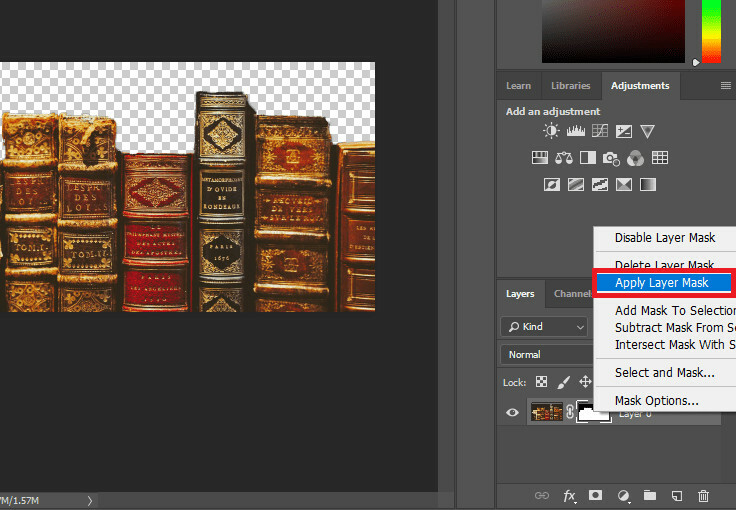 There are a couple of tools that you can use to delete the background of your image. Each of these tools works differently, just choose whichever works for you. 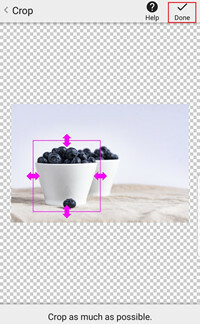 Auto: This is a very precise background editor tool. Just point the middle of the cross at the areas you want to delete. Manual: If the automatic background remover is not working, you can use this manual tool. It’ll take longer, but it will allow you to precisely remove parts of the image. Tip: If you make a mistake you can fix it by using the “Repair” tool. If you don’t like the sharpness of your image you can increase/decrease it by clicking on the numbers on the bottom of the screen. Once you’re satisfied with the sharpness, click the “Save” icon on the top right-hand side of the screen.